If you’ve been to Carbondale Middle School, chances are you’ve met Nicki and Rita. 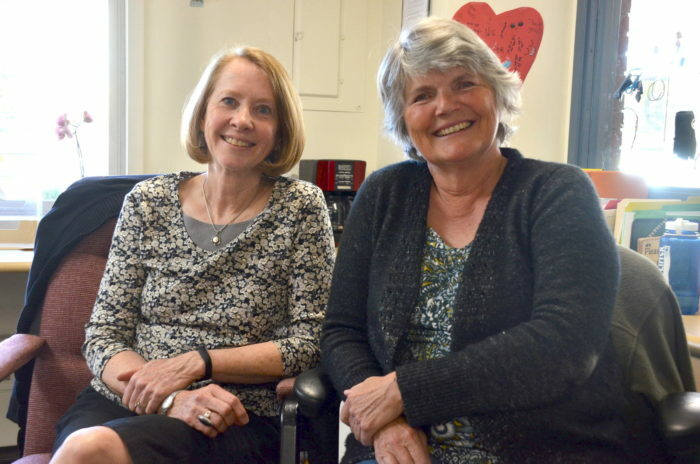 The school secretaries have been manning the main office for a combined 50 years, and in the process they’ve become almost inseparable. Indeed, it’s not uncommon for folks to mix them up or even combine their names, so we’ll stick with a first name basis here to avoid even more confusion. “We usually answer to whatever they call us,” one of them quipped. As such, it’s hard to imagine a time when Rita Overbeck did the job on her own. That was back in 1991, a decade after the Greeley native moved to the mountains with her family. It provided the perfect opportunity to keep the same schedule as her daughters, but proved far from easy. When another full time secretarial position came open in October 1993, one of Nicki Zugshwerdt’s three kids suggested her to Rita. From Englewood originally, Nicki had a fondness for the area from spring breaks in Glenwood Springs when she and her husband considered a return to Colorado after a stint in South Dakota and had just started as a secretary in Basalt. “It wasn’t very nice of me to only work there for a short time,” Nicki noted. Nicki, who planned to be an accountant before succumbing to the family business (her mother, sister and cousin were all school secretaries), took on the financial end of things, as well as supplies and coordinating field trips. Rita handles matriculation, attendance, substitutes and the like. Most of what they do, though, can’t be contained in a job description. For a few years, they also took charge of putting together a yearbook, first via literal cut-and-paste and later in a digital format. It gave them a perspective on all the facets of student life that didn’t go through the office. Often, the students they get to know best are the ones who were sent out of class for one reason or another. While some may be be labeled as troublemakers, they almost always behave for Nicki and Rita. Even if they did act up, there aren’t a whole lot of tricks the secretaries haven’t seen. “It’s fun to prove to the kids that we may be old but we’re not stupid,” Rita chuckled. “You just hope that they learn from them,” Rita added. They’re also the de facto school historians, having spanned two buildings, three mascots, four principals and eight vice principals. The move from the old building — a labyrinth of additions dating back to the ’30s that currently houses Bridges High School — was particularly memorable. The whole school was set to move into the old Roaring Fork High School building in 2007, but asbestos mitigation set the whole project back. The challenges were compounded by the addition of the fifth grade, which had been part of Carbondale Elementary School until the final move to the Crystal River Elementary building. For what turned out to be a whole school year, the eighth grade operated out of modulars and classes were taught out of the boxes they had packed the previous spring. By comparison, the current construction in the auditorium, library and on the lockers is a minor inconvenience. The mascot switch was somewhat less dramatic. When they first started, it was the “AllStars,” which Nicki recalls wasn’t a particularly fun mascot. The whole school voted to change over to the “Wolverines” — though neither Nicki or Rita could confirm whether the suggestion was an intentional “Red Dawn” film reference. The final and current change was more recent, when CRES and CMS both aligned with the RFHS Rams mascot (which itself changed from the Bulldogs when Basalt briefly joined Carbondale Union back in the day). Of the principals they worked with, the longest running was Cliff Colia, who also happened to be the person who had the most trouble keeping their names straight — at least at first. “There for a while we would wear nametags, just so he could remember,” Nicki laughed. The secretaries relationship, though, goes deeper than just work. “We’ve become best friends,” Rita explained. They’ve travelled together in Alaska, Vancouver and Lake Powell, among other places. Their youngest daughters were born two weeks apart. “We said they were twins separated at birth,” Nicki said. The coincidence was compounded when they both came back from Christmas vacation with the same news of impending grandchildren — who ended up being born a day apart in 2014. “We’d been working together too long,” Rita observed. And while some things haven’t changed over the years, technology has left its mark. “We used to do attendance by hand, then it was bubble sheets, now it’s all web based,” Rita recalled. For the office, the march of progress is mostly positive, but in the classroom there are a slew of new requirements. “I was always grateful I wasn’t a teacher, and they work so much harder than they used to,” Nicki noted. It’s apparent with the students, as well. The office now keeps a box of temporarily confiscated electronic devices. “The biggest change I’ve noticed is how dependent they are on their phones,” Rita said. “They’re exposed to so much more,” Nicki added. There’s also the matter of the greater variety of school choice and the corresponding plateau and even drop in CMS enrollment. While the open enrollment public option is sometimes looked down on, Nicki and Rita believe it’s as good as it gets.